Looking to invest in gold but unsure what products will be best for you? Take a look at our top 5 bestselling gold investments including some background information about the product and the kind of investor they appeal to. Offering high flexibility in a relatively small unit size, the gold Britannia is our bestselling product. 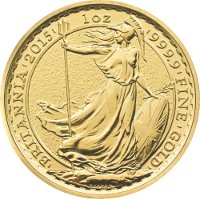 Favoured by investors looking to benefit from its Capital Gains Tax exempt status, the one ounce gold Britannia is the most cost-effective way to invest in British tax free gold coins with sovereigns attracting slightly higher premiums due to their higher manufacturing costs. 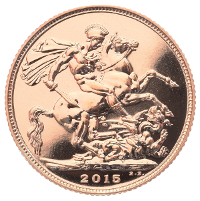 Our gold Britannia coins are supplied brand new direct from the mint. The sovereign is one of the most popular and recognisable gold coins in the world. The gold sovereign appeals to investors of all sizes looking to benefit from their compact unit size and Capital Gains Tax exemption. Our gold sovereign coins are supplied brand new direct from the mint. 1oz gold bars are popular with smaller investors interested in flexible, low margin units. The smaller sized bars appeal to individuals unconcerned with Capital Gains Tax exemption. 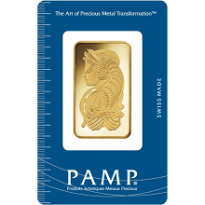 The small size of the 1oz gold bar makes them easy to store and sell. Our 1oz gold bars are the very cheapest way to buy an ounce of gold. All our gold bars are brand new, pure 24 carat direct fromLBMA approved refiners and include a certificate of authenticity. Our most frequently invested bar size, the 100g gold bar offers a price benefit over smaller coins. In addition to great value for money, its small size also maintains storage and selling flexibility. 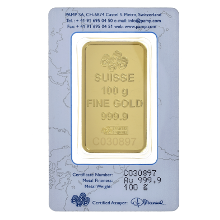 Our 100g gold bars are the very cheapest way to buy 100 grams of gold. All our gold bars are brand new, pure 24 carat direct from LBMA approved refiners and include a certificate of authenticity. 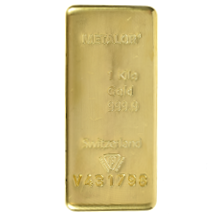 Benefiting from economies of scale, the 1kg gold bar is one of the most cost effective ways of buying gold bullion. This large gold bar will appeal to investors who are seeking great value for money and who are not concerned by CGT. Our 1kg gold bars are the very cheapest way to buy a kilo of pure gold. All our gold bars are brand new, pure 24 carat direct from LBMA approved refiners and include a certificate of authenticity.